Where have all the Medals gone? 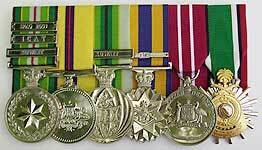 Have you ever wondered what happened to your relatives’ service medals? Possibly they are with another member of the family, or maybe lost or stolen, or it could be that they have never been claimed by your family. The Medals Section of each of the Defence Forces Navy, Army and Air-Force Departments, have literally thousands of unclaimed medals dating back to the First World War. It was not uncommon for folk to not bother applying for their entitlement. For some, it only served as a reminder of the horrors they witnessed, and for others it just didn’t seem important. Whatever the reasons, and no matter how long they remain unclaimed, the entitlement of the ex-serviceman or woman, or indeed, their next of kin, still stands. P.O. Box 5922 South Windsor NSW, 2756In the event that the original issue is not available to you, fully authorised Replicas can be obtained from the above company. They can even assist with researching your family’s contribution in times of military conflict. The Australian War Memorial Research Section, Australian Archives and each of the respective Defence Forces also have staff dedicated to the task of assisting with research into your family’s military contribution.